I am a true woman of the Northern Cape. 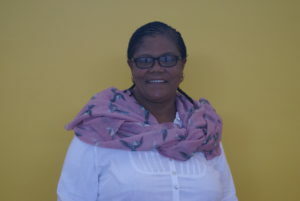 I was born and spent my childhood in De Aar, married a local man and worked on the De Beer’s Finch Diamond mine in Lime Acres for over 20 years as a Senior Accounts Clerk. As with most people from the Northern Cape I have also experienced my fair share of hardship. I got divorced in 1999 and being a single mother with three children, I had to put in every measure to make ends meet. For extra income, I started baking doughnuts and puddings on Sundays. I even went to Johannesburg and bought blankets to come and sell on the mine. My worst experience was losing my son (my eldest child) in a car accident in 2002. I was heartbroken. You can never recover from something like that. I was then retrenched from the mines in 2007 and I was forced to move back to De Aar. This was a tough time, but things started to turn around for me a year later when the mine called me up to ask if I wanted to take up a contract with them to run a laundry service with another woman who had also been retrenched. The contract ran for four and half years, but my business partner and I decided to start an events business on the side in order to bring in further funds. When the contract ended we split the assets and I returned to De Aar in 2013 with the aim of successfully launching my own events business. I believed my business would work well as I saw the need in this town for such things. More importantly I had to make it work as my age would not allow me to get full-time work again. I needed to stand on my own two feet and do my own thing in the business world. Shortly after arriving back in De Aar my life took a dramatic turn yet again when I married my childhood friend, Edwin Kamies, for whom I am extremely thankful and who supports me so much in my business. Even with this emotional and practical support and personal drive, the problem with this industry is that it is seasonal and I would go through patches of having no work at all for months. In business and even through this programme I have learnt that the first six years of your business it is not so easy. Your income will go up a bit and then go down a bit. Also you need to build up the courage to go on. Through this programme I really learnt how to be strong. On a more practical level, I learnt how to market my business and how to do my finances properly. This programme is more advanced than any I have been on before. The course material is very helpful and I can go back and look through my textbook if I am stuck with something. My mentor is also available to me whenever I need him. I can call him for advice or visit him when I am in Bloemfontein. Through the funds given to me by Solar Capital to purchase my income generating assets I also became a trend setter in the area. I am the first events business to have Tiffany chairs! So that I can receive work throughout the year, I am working with my mentor on marketing myself as an events planner for kiddies parties. Nowadays people want to take their children out for parties and if I can rent a venue where I can create a fun and safe environment this will bring in business all year round and hopefully allow me to employ others. I really see the benefit of continuing to expand this programme. It will help many people. I benefited hugely and so can others. Solar Capital you are the best! Not only do you Generate, Innovate and Transform, you bring sunshine into my life!